A great conversation starter… | Finding delight. Imagine: You’re catching up with a dear friend over a mug of something warm. You’ve already run through the past week and a half of activities, all the annoying things your boss has said recently, and your thoughts on a new-to-you podcast. You’re not ready to part ways just yet but…topics are waning. What’s the best thing you’ve won? As I mentioned in yesterday’s post, one of my New Year’s resolutions was to ask more thought- or conversation-provoking questions, and this one has quickly become a favorite. And YO! There’s no reason I have to keep my convo-startin’ questions IRL, is there? So I wanna know, dear reader (THAT’S YOU! ): What’s the best thing you’ve won? COMMENT BELOW and tell me everything. That is a really interesting question! It immediately makes me think about the tickets I won to Cirque du Soleil and the crazy trip my roommate and I had to make home from that event when all of the freeways were shut down for construction. What stories! This question really can bring up great topics of conversation. Yes, I love the little “spin-off” stories that come out! Love the travel question, too. I’ll definitely start working it into my (nosy) repertoire. LOL! When i was 25 i won a trip to L.A. My very first trip by airplane and abroad! It was the best gift ever! Oh my gosh, HOW COOL! That’s certainly a prize you’ll never, ever forget. 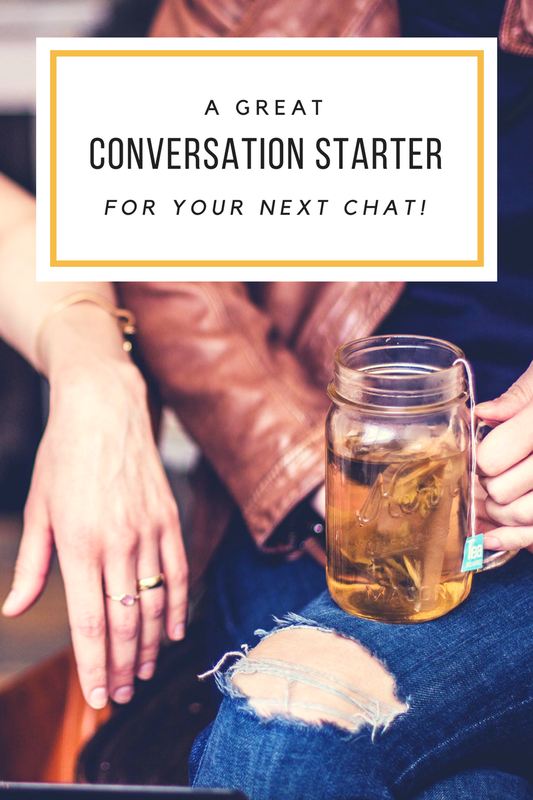 Definitely a great conversation starter! As for the question, I don’t win many things so best thing I’ve probably won is a scratch ticket lol! Ohh nice convo starter indeed! Best thing I’ve won… hmmm a Volleyball Tournament Championship Title counts right? Yup! I was a member of a champion team back in highschool. so yeah. Wow. I never really thought about the best thing that I have won. This is a great conversation starter. I will have to think about this. I don’t think I’ve ever asked anyone this question. But of I’d have to answer it, it’d probably be winning a pinata for drinking the most chili beer at a Cinco De Mayo beer festival. Well this was unexpected. When I read your title I wasn’t expecting something so simple yet effective. And I think this would encourage people to be more, do more, be better.